Thursday, February 22nd @ 7:00PM – Only $26.95 per seat! 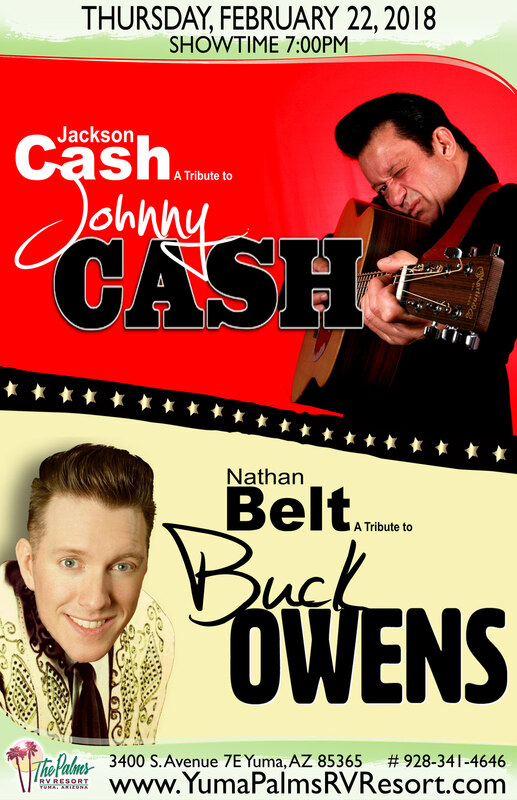 Starting with the grass roots days of Country and Rock-a-Billy to the Man In Black prison concerts, our tribute to Johnny Cash has been a stand-up hit in Branson, Missouri. This is no Broadway musical show, but an authentic recreation of the music and the man that captured the hearts of millions. You will be astounded by the uncanny resemblance that Jackson has to Johnny Cash. You will be even more astounded by his voice. Jackson truly captures the presence of Johnny Cash, not only through Johnny`s music but also his storytelling. From the moment Jackson and the New Tennessee Two Band takes the stage with a traditional Johnny Cash greeting to his exit, with guitar slung over his back, Jackson offers an exceptional portrayal of Johnny Cash. Johnny Cash chose only to work with one band and depended upon them to provide him with the unique sound that would come to be recognized by millions of fans over the world. Luther Perkins provided the unique “boom-chicka-boom” guitar that classifies most of Johnny`s songs, W.S. Holland holds his own place in music history as the first Rock & Roll drummer while Marshall Grant slapped the upright bass. This is all recreated for this tribute and the music of The New Tennessee Two is as important to the sound and successes of Jackson Cash as his own voice.